As a group we will be focusing our project on the topic of Cyborgs from our Week 4 discussions. “A Manifesto for Cyborgs: Science, Technology, and Socialist-Feminism in the 1980s” by Donna Haraway is going to be a main muse as we explain our views of how cyborgs are becoming even more a reality than she explains in her text. We are going to create a video that shows our ideas that over the past decades we have seen technology become a greater part of our lives with each new day. With this video we plan on incorporating key quotes from Haraway’s message in a way the exudes scholarly reflection on this complex idea. In our video for this project you will see clips from very famous Hollywood films both from the past and present to represent our ideas. There will also clips from old television series clips that help to bring our vision to life. Lastly we hope to incorporate real life news stories into the video. Once again this is to make anyone who watches this video realize that technology and cyborgs have become an increasingly integrated part of our society. As we look for some form of inspiration for this video we hope to modle it similarly to this link http://vimeo.com/42493941. As a group we believe this type of video will give us a chance to convince the audience of our key points through the examples in our video. Reliable or Not? 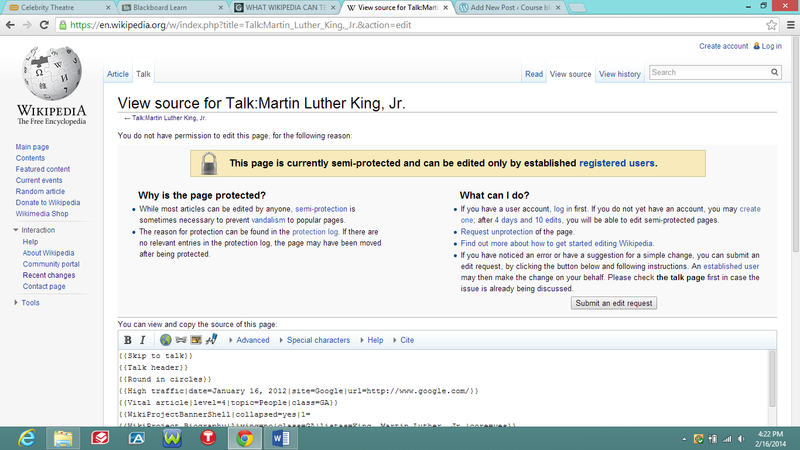 Wikipedia and Dr.King. Wikipedia has been known as a great place to find quick information and also a threat to knowledge. This threat comes from the idea that anyone can edit any Wiki page on the internet. And because of this misconception, teachers, professors, and some students believe it is not a reliable source for information. Through some research and a look at a specific page I have found this not to be the case. As I looked up a man that has had a lot of influence in the United States, especially its rough past, I found out that there is more than meets the eye about Wikipedia. Martin Luther King Jr. was the man I had to look up. Learning about him and his time on this earth has been pounded into my head by teachers and my parents since I started my education. The “I Have a Dream” speech has been played countless times while in school during Black History Month. If I were to find any facts that were not true on a Wiki page, it would have to be Dr.King’s. As stated before there has been a growing divide between those who think Wikipedia is something that is not helpful in terms of finding good knowledge on a topic. The term used around Wikipedia that serves a great purpose through the rest of this essay is “collective intelligence.” This is the term used to describe how Wikipedia can work based on a group of people pooling their ideas and facts together for the betterment of gross knowledge. One thing that also came up was the amount of traffic this page has gotten and continues to get. People continually rely on this site for good helpful information as we can see in this picture. All of this information that is being taken in on a daily bases cannot simply come from one person who knows all about Dr.King. There are several people that have a specific knowledge about him and they come together through Wikipedia to inform the masses. This idea relates to a part in Jenkins’ article called Redefining Expertise which he discusses the concept that was just described. We can see changes being made to this page about every couple of days but most of which are just minor changes. We know that no page will ever be truly complete but with the accessibility to this wealth of knowledge we can see there is a sign that Wikipedia is doing good for the world with the ability to bring together people from different parts of the world to get as much solid information on big topics of interest. Jenkins, Henry. “What Wikipedia Can Teach Us About The New Media Literacies.” Web log post. Confessions of an Aca-Fan. N.p., 26 June 2007. Web. 13 Feb. 2014. Limited to only one hundred and forty characters there is a new type of media that came out nearly 8 years ago. Of course I am referring to Twitter which has seem to grow in importance all over the world in just the past 3 years. It took a while for the public to move from the ever growing Facebook app to Twitter, which is currently sitting at 645,750,000 users. As you look at the structure of Twitter most can see similar features that have appeared in its competitor and predecessor Facebook. Both have a timeline that start at the top with the most current post and drop down to later posts. Clearly Twitter is not something new to come to the internet but its changes are what make it seem new and exciting. 8ew technology. The limitation of just that few characters had not been around and also the term microblogging had not appeared in many places until Twitter came around. After that paralysis was over figuring out how to spit out ideas in 140 characters was difficult. It took time for users to come to grips with all that Twitter can be. When it came to adapting to the use of twitter the world saw it expand globally. Hashtags for humanitarian purposes that have saved lives. Conversations between people from all walks of life. We have seen tweets change lives and start movements like the 99 precenters that took over Wall Street just a handful of years ago. Some of the people in an older generation say we are typing out our lives for the world to see forever. And in truth once something goes on the internet, it never really goes away, our words are etched onto the digital walls of the internet forever. The world may be able to see it right after it’s posted or maybe years later similar to the hieroglyphic walls around ancient Egypt. 6entertained during your down time, know that this form of technology will be a part of history forever.